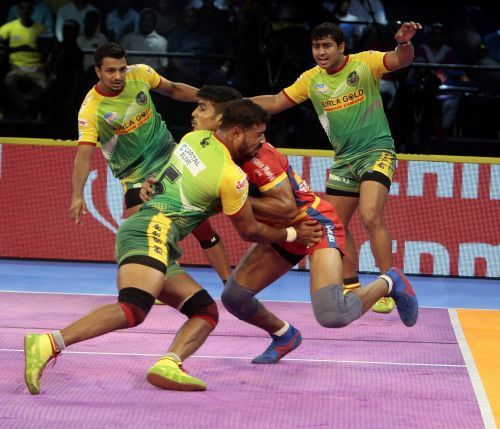 Season six of Pro Kabaddi witnessed easily its best match of the season thus far on Thursday evening as defending champions Patna Pirates beat UP Yoddha 43-41 in a close, tense battle. The lead never crossed 4 points throughout as both teams kept chipping away at each other with neither side backed down by the other. Patna coach Ram Mehar Singh, after the match, believed his defence came to the fore today. Indeed that was the case as Shrikant Jadhav, who was Yoddha's top raider tonight with 12 raid points, was caught on the last raid just a few inches away from the midline with the game at 42-41 in favour of Patna. The Yoddha today played without Jeeva Kumar, one of their main defenders. When asked about his omission from the matchday squad altogether, Yoddha coach Jasveer Singh said it wasn't because of injury, but rather “squad rotation”, something which they plan to do through the season. Yoddha captain Rishank Devadiga, despite scoring 7 raid points was largely pacified by the Pirates’ defence. His aggressiveness seemed to wane as the match went on. The Pirates and Yoddha will battle again next Wednesday in Sonipat in their next fixture.